What is a Guitar EQ Pedal? What Does a Guitar Equalizer Pedal Do? Conclusion – Which Guitar EQ Pedal is right for you? Guitar EQ Pedals are real-time processors that help adjust the amplitude (volume) of a guitar audio signal at specific frequencies. These specific frequencies are determined by the user, and depending on the settings will help either amplify or suppress a frequency spectrum. Guitar EQ pedals are more often used within a live performance environment, particularly useful for musicians who want to take control of their overall guitar sound, who may not have access to the venue’s FOH system or have EQ functionality built-in to their amplifier. EQ pedals for guitar are generally not used within a recording studio, since equalization will be taken care of by the studio desk and outbound rack-mountable EQ processors, which usually provide very high-quality EQ. 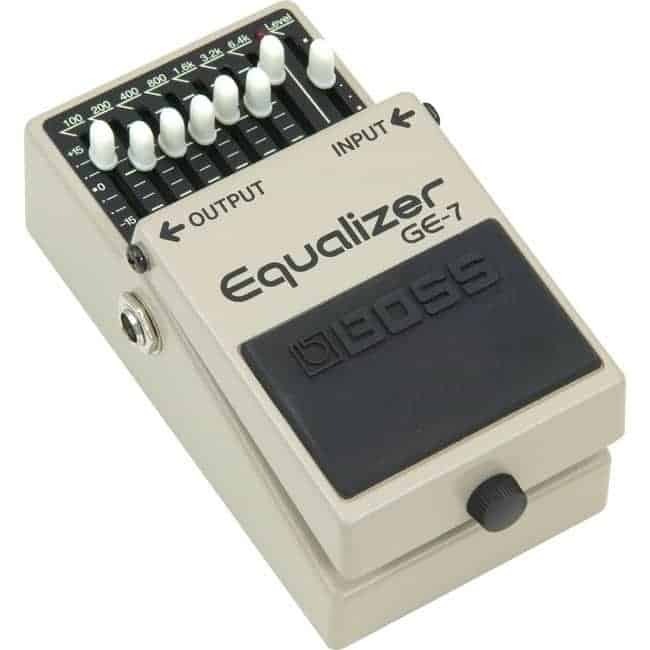 As we’ve previously discussed, a guitar equalizer pedal will help accentuate or reduce the amplitude of specific frequencies that the user specifies on the interface. Guitar EQ Processors will usually provide the user with the ability to make frequency adjustments from around 50hz/100hz on the low end to 10,000hz (10Khz). Although some might think that it’s only important to have access to low-end frequency adjustment, it’s also important to be able to reduce enharmonic frequencies that resonate above the core frequencies that are being played by the guitar, often causing harmonic distortion. Guitar EQ Pedals are more commonly used alongside other guitar effects pedals, such as a guitar compressor pedal or a guitar tuner pedal. The question of where should a guitar eq processor be placed within the signal path? arises, and we think it should be placed towards the end, helping control the overall post-effect frequency output. So let’s get to it, what are the best guitar EQ pedals of 2019? The Behringer EQ700 is the most affordable EQ pedal that we are featuring within this list, and rightfully so considering the mass of positive reviews indication good value for money that it simply provides. The unit itself is incredibly versatile, and can be used to provide EQ for both Acoustic and Electric Guitar; This is because it provides a wide frequency range, enabling the user to boost/cut frequencies between 100hz and 6.4Khz. Not only this, but the interface offers 7 bands of EQ, meaning that specific frequency range isolation can be achieved, providing accurate signal boosting/cutting. As for the design of this pedal, it’s fairly basic, and similar to other Behringer guitar units as it seems that in order to provide a pedal that sounds good, they have to make compensations in the overall build quality. That’s not to say that this unit won’t be able to handle a few knocks, as it will! But it’s not necessarily going to last as long as the Boss equivalent EQ pedal (GE-7) which is encased in a solid metal chassis, and hence has a 5-years manufacturers warranty. As you can hear from the video demonstration featured below, the pedal itself sounds extremely good, and when considering that it is priced at under $25, it screams out incredibly good value/quality for the money, which is exactly what we’re all looking for in an effects pedal. Either way, like anything in life, we like to take the majority vote, with the assumption that the mass will usually portray the honest truth about a product… Therefore, since it has scored a 4.1/5 star review from over 176 amazon ratings, we suggest that it’s a risk that is safe to take… And all for around $25, what a bargain! In general, as you can hear from the demonstration video, the pedal itself sounds particularly good! And if you think so too, then it may be the EQ processor for you! It’s fairly simple to say who this pedal is suited for, that’s because it’s primary USP is its price! Therefore, this unit is perfect for the guitarist after a very cheap EQ pedal, providing suitable enough sound-quality to use for live performances/shows and in recordings. The Tomsline AEG-3 GT Analog EQ pedal for guitar is one of the smallest units featured within the list. Not only this, but it’s also the ‘joint 1st’ cheapest EQ pedal. The pedal itself measures up to be … by … in size, making it extremely suitable for the guitarist who doesn’t have too much available space left on their pedalboard, and this just so happens to be its largest USP and really the only aspect that would make it a better choice over the Behringer EQ700 unit. Let me explain, see the Tomsline AEG-3 GT provides a frequency range from 100hz – 4.0Khz, and has 5 bands of EQ controls. In comparison, the Behringer EQ700 has a frequency range of 100hz – 6.4Khz, allowing over 2.4Khz in the high-end (treble) range to be boosted/cut which simply translates to having more frequency control over the overall sound. Additionally, as the Behringer unit is larger, it offers a 7-band eq control, which delivers more isolation and frequency boosting/cutting accuracy. However, it’s not all bad for the Tomsline AEG-3 GT unit! Like we said before, it is the smallest processor that we’ve featured, and therefore if you haven’t got any room spare for the likes of the Behringer EQ700 or any of the other budget-priced devices, the AEG-3 may be the best option. As you can hear from the video demonstration featured below, this pedal sounds rather nice, helping to maintain clarity of the input signal, whilst then modifying the EQ settings. Again, when considering that it is priced at under $25, its screams brilliant value for the money. However, unless size is particularly important, we think that the Behringer provides more functionality for the same price. This pedal has a 5/5* review, from only 2 Amazon customer ratings… Therefore we would personally like to see Tomsline pushing for more customers to leave reviews for the product; This way, simply more data from real customers is available for readers to be able to get a better understanding to the positives and negatives around using the product. And yes, although this may not be an improvement with the product itself, it certainly relates to the product and people’s experience of using it. When strictly talking about the product itself, it’s very difficult to point out improvements that should be made, as the unit is less than $25 and therefore at this price, additional functions and re-designs would simply not be realistic or achievable without the costs directly affecting the unit’s price. It’s fairly simple to say who this pedal is suited for, that’s because it’s primary USP is its price! Therefore, this unit is perfect for the guitarist after a very cheap EQ pedal, that’s small enough in size to fit on your pedal board. As we talked about earlier, the Behringer EQ700 product has more impressive feature statistics (relating to the frequency range and band EQ settings), but we realize that it may be too large or bulky in size for some. The Joyo JF-11 EQ processing pedal for guitar is another much welcomed budget-priced solution on our list of the best eq pedals for guitar, why exactly? 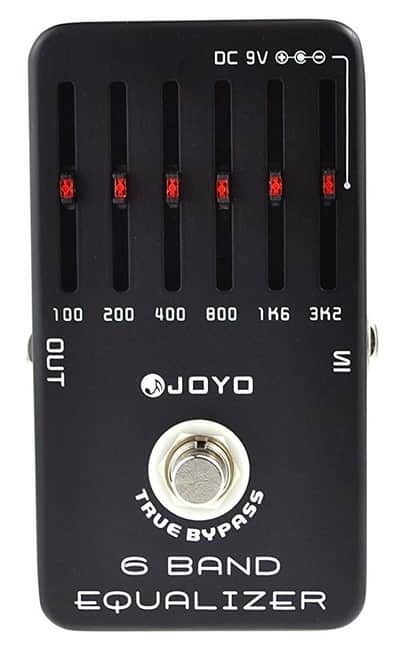 Well, the Joyo JF-11 has a range of enticing features, with 6 bands of EQ, +-18db of frequency boosting/cutting and 6 LED lights for increased visibility, especially considering that they are located on top of each band EQ knob, so you know exactly what your settings are, at all times when the pedal is engaged. Additionally, one of the largest selling points to this, other than it being small in size, is that it comes with a 9V internal battery; So you have the option to use the pedal on its battery-life power alone, although we would not recommend this, as you can never really know when the batteries are going to run out! Overall, as you can hear from the video demonstration featured below, the processor itself does well in providing accurate EQ boosting/cutting, displaying its EQ capabilities whilst the guitar is run on a distorted setting. With that being said, we would highly recommend that you take a look at the Amazon reviews, which are linked to above, as there are over 115, meaning that you can really gain a good indication to what this pedal is capable of. However, when comparing this unit against other pedals within this list, you can begin to see where it lacks in functionality. Ok, so we acknowledge that this pedal is fantastic value for money! However, we cannot help but directly compare it to other similarly priced units, such as the Behringer EQ700. Firstly, the Behringer is priced a little cheaper, (over $8, which although this doesn’t sound a lot, considering the price is $33 vs $25, it’s nearly a 25% price difference) and provides a wider frequency range, being 100hz – 6.4Khz, in comparison to the Joyo JF-11’s 100hz – 3.2Khz range. Additionally, the Behringer is larger in size, which will be beneficial or not depending on your preference, but it provides 7-bands of EQ control and a general output volume control. When comparing this with the Joyo JF-11, it only provides 6-bands of EQ control and does not offer an output volume control. Despite these slight judgments, it’s clear from the Joyo’s accumulation of positive Amazon reviews, that the product is certainly a winner. It’s just that we’re here to merely add our views and opinions about the products, so as to give you the best indication on what to consider and potentially purchase. As we’ve explained with other pedals previous to this, the Joyo is priced around $33 and therefore to us, remains a budget-priced pedal. With that being said, we think there are better options around this price-point to choose from (Behringer EQ700), but this is also a good product to consider. The Ammoon EQ7 equalizer pedal is another more compact-sized unit that we’ve featured within our list. Ammoon has priced this at around $34, which we would still consider as being a budget-priced eq unit… However, what exactly do you get for this price, and how does it compare against the other affordable processors? The EQ7, aptly named, provides 7 -band EQ slider functionality, which is great for such a compact unit. This is because they have gone about designing the sliders to slide horizontally, as opposed to vertically… Which as in turn allowed them to provide more sliders, although we would assume this means that the slider sensitivity has increased, due to their being less space between the cut and boost ends. Additionally, the company has really tried to differentiate their product within the market of affordable guitar EQ processors, and they have done this by providing a unit which supports more low-end (bass) eq modification. Impressively enough, even despite this focus on providing low-end EQ functionality, the unit still supports up to a 5Khz range, where you can focus on boosting/cutting those en-harmonics if needs be. However, because of this large range, particularly in the low-end frequency spectrum, it makes this pedal incredibly versatile and would be usable for Bass, Acoustic and Electric Guitar. So if you’re looking for a great, low-cost, compact all-rounder, this may be for you! As for how the pedal sounds, it’s clear from the video demonstration that it provides a very clean, rich sound, especially on the mid boost setting; Additionally, we even like how it sounds with added distortion, with the pedal really being able to equalize the (sometimes) harsh tones of the overdrive, to a more bearable level… Ideally this would be done on the distortion pedal, however, it’s a testament to the Ammoon EQ7 that it can help relieve some of these frequencies later in the signal chain. Overall we really like this unit… Do we like it as much as other budget units featured within this article (Behringer EQ700)…. No, but it’s not bad. One aspect that we prefer about the Behringer is that it has a battery-powered capability, as it features an easily accessible battery compartment that a 9v battery can be used in. However, most guitarists would agree that they would prefer to use a 9v power-supply with their pedal board, so there’s no risk in anything accidentally turning off! Even despite these slight judgments, the unit has an average rating of 4.2/5* from over 10 Amazon reviews, providing that the product is certainly satisfying its owners. 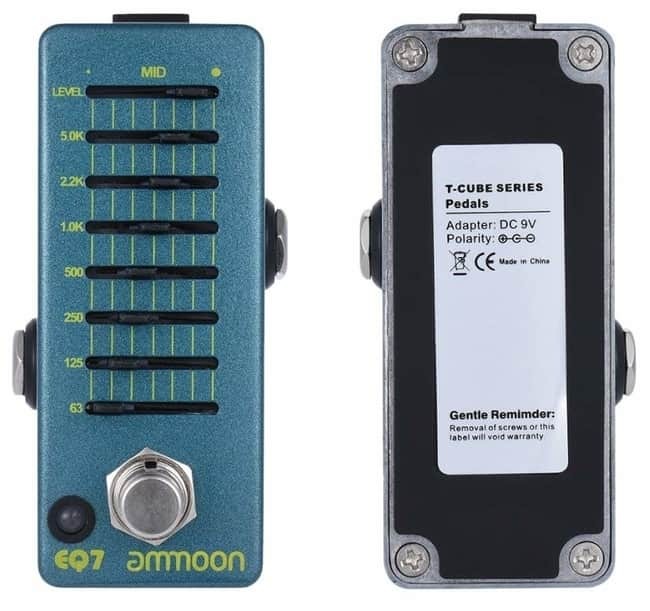 The Ammoon EQ7 has three main USPs that make it attractive to a certain buyer. These are the fact that it’s incredibly small in size, is very low in cost and finally (the largest USP) it provides frequency boost/cut down to 63hz. Therefore, if you’re a guitarist who likes to play in down tunings, and you really want to emphasize the lower frequencies, or if you also want a pedal to be versatile enough to play with your bass guitar, this pedal would be able to do this, better than other budget-priced pedals within this list. 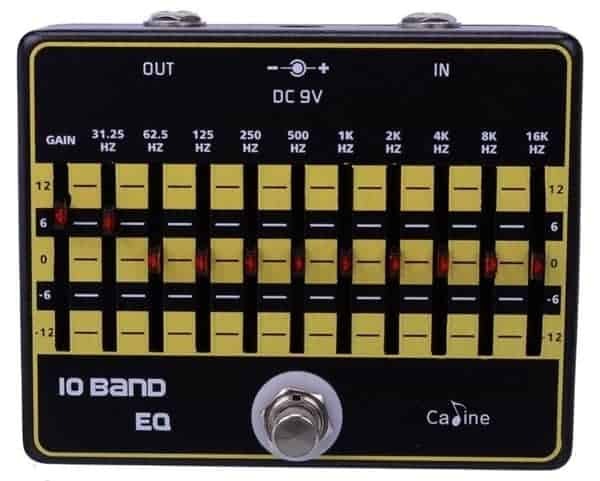 The Caline USA, CP-24 is a 10-band EQ processing unit. The product itself is priced at around $36 and therefore it aimed at individuals who aren’t wanting to spend a lot of $$$. However, what do you get for the money? Let’s find out! Impressively, the Caline CP-24 provides 10-bands of EQ control, with a frequency spectrum from 31.25hz to 16Khz, well into the sub-bass frequency range, through to the high treble range…. And therefore when directly comparing this with other budget-priced units, it’s clear that Caline has really tried to knock this out of the park, so to speak! Because of this extremely wide frequency EQ range, it simply means that you have more control over the overall sound, and this unit would even be suitable as a bass EQ pedal or even for use with an acoustic bass/guitar. Additionally, because it has 10-bands of EQ controls, it means that scooping (isolating) a certain frequency that you want to boost/cut is a lot more achievable with this unit, in comparison with units with fewer band controls. With that being said, how does this unit operate, and more importantly sound? As you can hear from the initial introduction of the video demonstration below, the CP-24 provides a real mid-range boost to the guitar’s sound, driving those mid-frequencies in the mix and giving the overall tone a breath of new life. If we hadn’t already have known the unit’s price and were just going off how it sounds, we would have thought that it was a lot more expensive. The unit is noted as being solidly built, with no major issues (zero hum or buzz)… We’ve also seen that bassists are utilizing this unit and really like how it sounds too. For more information visit the Amazon ratings page, which we’ve linked to above, it has over 22 customer reviews, with an average rating of 4.3/5. This unit provides incredible value for money, and hence there are simply 0 improvements that we think need to be made! Simply put, the Caline USA, CP-24 is ideal for any guitarist who’s looking to get the most ‘bang for their buck’… The unit has the widest frequency response of any budget-priced EQ processor (from 32hz – 16Khz) that we’ve looked at, and it also provides some nice additional features such as lights on each EQ band slider, which makes it suitable for use in dark environments such as a live performance venue. The MXR M109S EQ pedal has received an average rating of 5.0* out of 5 stars from 14 Amazon customer review – Read these reviews here. 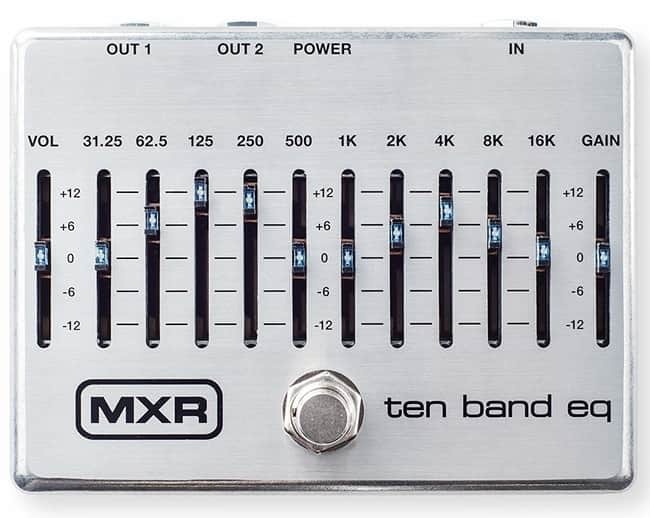 The MXR M109S EQ unit is priced as more of a mid-range budget option, costing around $90. For this, you’re getting an EQ pedal created by one of the most reputable, experienced companies in the music effects pedal manufacturing industry. For those who may not know the manufacturer, they are a company called MXR, which is owned by Jim Dunlop, who have been established since the early 1970s. Therefore, because of this long period of time in which the company has been established, it has meant that they are the pioneers within the industry, setting the high standards for their competitors to match. The M109S is an extremely compact, lightweight pedal that is housed in Aluminum casing, to ensure that the unit is protected, which is especially important if you’re going to be taking this to live shows/gigs/tours and even studio recording sessions… After all, you want to be able to rely on it night after night! According to the reviews of this product, the pedal is incredibly reliable, quiet and gives your sound a beautiful tone… All of the 14 customer reviews expressed only positive comments, impressive right! As you can hear from the video demonstration, the unit itself sounds very good! Adding a nice amount of brightness to the overall guitar mix (when the guitar is both in a rhythm & lead mode) and providing the ability to scoop unwanted frequencies. Additionally, when engaged, this unit provides a substantial boost to the overall output signal, which can even be used for creative uses for the purpose to gain controlled feedback (as shown at 3;35 in the video demonstration. However, we’re not here to talk about ‘how incredible’ this unit is, we’re here to be honest! However, one thing that is hard to measure is internal circuitry quality… But with companies such as MXR and Boss, they are expensive because of the level of quality and R+D that goes into the development of their effects processors. With that being said, as you can hear from the video demonstration, and see from the customer reviews, the MXR M109S provides high-quality internal circuitry, which shows in the sound quality. This makes up for the fact that its frequency range and number of EQ bands is more limited than other pedals. This EQ pedal is for guitarists who’re looking for an EQ solution from a company that can clearly provide high-quality, reliable and affordable products. Additionally, it’s also for the guitarist who wants a pedal that looks great, especially in a dark environment. The Boss GE-7 pedal has received an average rating of 4.1* out of 5 stars from 41 Amazon customer review – Read these reviews here. The Boss GE-7 unit is priced at an upper-mid price range, standing at around $115. For those who don’t know much about the brand Boss. They have been in operation since the early 1970s, and are in fact a division of the Roland Corporation. Since this early time, they have witnessed and pioneered the development of music effects pedals, from analog to digital, releasing several versions of their famous pedals. Because of this, the company have a wealth of experience in developing guitar effects pedals, and have complete confidence in their products… providing a standard 5-year manufacturers warranty with all of their product lines. Boss guitar pedals are renowned for being ‘built like tanks’, and the GE-7 is no different. The GE-7 has been in production since the 1980s and yes, that means that it’s been selling for over 30 years, with adjustments, granted. The pedal’s internal analog circuitry is protected by a dense metal chassis, making it suitable for playing live shows/studio recordings without having to worry about its survival… Generally, Boss pedals will last a lifetime. With this being said, how does the pedal sound? As you can hear from the video demonstration, the unit does well in providing a clean boost for a specific frequency range within a mix. Now, we would have preferred for the video demonstration to directly compare the sound to when the unit is disengaged, but it’s still a nice demonstration video. As previously explained regarding the MXR M109S, the Boss unit appeals to guitarists because of the wealth of experience Boss has in producing high-quality audio equipment, and therefore this remains their unique selling point, in comparison to their newly founded competitors. With that being said, the Boss GE-7 does not have the largest frequency range, not the largest amount of dB boost available. However, it provides reliability and high-quality circuitry. However, we wish that Boss featured lights on each individual slider, so that the EQ settings are more visible within dark environments (such as on-stage). With that being said, as you can hear from the video demonstration, and see from the customer reviews, that the Boss GE-7 certainly satisfies its owners. The Boss GE-7 is for the guitarist who wants an EQ pedal that will provide high-quality equalization, that will most likely last for years and years! Hence why the company includes a 5-Years Manufacturers Warranty with all of their products. 2 Internal Dip Switches which adjust boost frequencies & EQ settings. The Xotic EP Booster/EQ pedal has received an average rating of 4.5* out of 5 stars from 111 Amazon customer review – Read these reviews here. 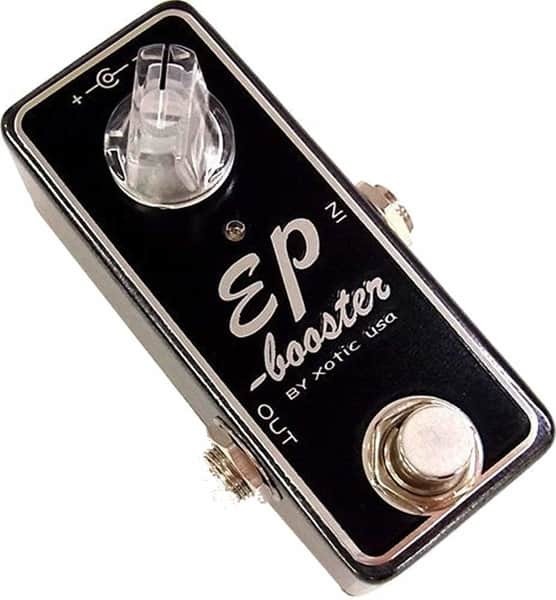 The Xotic EP Booster/EQ pedal is exactly how its described… A mix between a booster and an EQ pedal… With no specific EQ bands that can be modified, but the unit boosts the overall sound by up to 20db when engaged. The internal circuitry is based on the pre-amp section of the legendary EP3 EchoPlex, which was a delay unit produced from the early 1970s the to the 1990’s. Many guitarists just utilized the pre-amp section of the unit, without engaging the delay effect, just to get a more saturated tone… Such guitarists who were renowned for doing this were Jimmy Page, Eric Johnson, and Eddie Van Halen. The pedal does feature two distinct dip switches that the 20db of gain can be applied to, these are ‘Bass Boost’ and ‘Bright Switch’… Which as you can probably tell by the names, when engaged, the ‘Bass Boost’ setting will apply up to a 20db (depending on the gain settings) on the low-end frequency spectrum, which is great to add for a guitar with single coiled pickups. Whereas the ‘Bright Switch’ is ideal for a duller sounding instrument, providing gain for only the upper-frequency spectrum, adding a bright shimmer to the sound. As you can see from the review ratings of this unit, it’s managed to score a 4.5-star rating from over 110 customer reviews on Amazon… So if you’re really considering this pedal, take a look at the reviews; We’ve linked to those above. To be honest, the fact that the internal circuitry of this unit is based on such a legendary processing circuit; We simply cannot suggest improvements as easily or as readily as we have done with other pedals. It’s clear that there is a large following/fanbase for this pedal… And if they like it, then we like it! The unit is for the guitarist who wants a simple-to-use Booster/EQ processor, which resembles the classic EP3 EchoPlex unit. Therefore, if you like how it sounds in the video demonstration, why not look take a further look at the reviews on Amazon before making your final decision. The MXR M108S processor has received an average rating of 4.4* out of 5 stars from 17 Amazon customer review – Read these reviews here. The MXR M108S is leaning towards being more premium-priced, at the cost of around $130. For this amount, you’re getting one heck of an EQ processor, with the capability to be used on a range of different instruments, including Acoustic, Bass and of course… Electric Guitar. The reason that this processor can be used on a diverse range of instruments is because of the frequency range that it can attenuate, being from 31.25hz (sub-bass) through to 16,000hz. The MXR M108S is the older brother to the 6-band MXR M109S EQ unit, and also features the same high-quality, low-noise circuitry. So other than the high quality built and internal circuitry, how exactly does this unit sound? The processor really does well at isolating the specific frequency bands, so that the user can boost/cut them and audibly hear a difference. Additionally, as you can hear in the video demonstration, the pedal does a great job in being able to keep up with the aggressive playing, particularly heard towards 3:00 and onwards during the processor’s engagement. After reading some of the reviews of this product, we found an extremely minor “improvement” that could be made, at least according to one review, explaining that the LEDs were simply too bright. Despite this small aspect that could potentially be improved, at least according to one of the customer reviews… The pedal has still averaged a 4.4/5 star average review from over 17 customers, meaning that it’s certainly satisfying owners. The unit is ideal for the guitarist who wants a unit that can provide an incredibly wide range of frequency EQ… Providing the potential and opportunity to use this pedal on a range of instruments, including Bass. Additionally, it’s incredibly well-built and provides great sound quality when used with both distortion and a clean sound. The Programmable EQ pedal by Source Audio has received an average rating of 3.7* out of 5 stars from 31 Amazon customer review – Read these reviews here. The Source Audio Programmable EQ processor is a Digital EQ pedal that is highly programmable, enabling you to sculpture up to 4 user customizable presets to easily refer to. The unit has found its way to being used in touring sets, with the likes of John Mayer, The Killers, David Gilmour and several other professional musicians using it. This is always a great thing to see, as generally these kinds of professional touring musicians are advised by the top experts on what kind of equipment they should use. The processor supports a frequency spectrum from 62hz to 8,000hz, and this is a great range for a guitar EQ pedal. However, if you’re considering using this with other instruments such as a Bass Guitar, although it has an octave extend function, enabling EQ down to 62hz, there are other pedals such as the MXR M108S which may be more suited, as their low-end EQ range is a little wider (from 31.25hz – 16Khz) and will be able to EQ the Sub-Bass frequencies. One aspect that we really like about this unit is the fact that you can easily and quickly switch between the 4 user-programmable banks, which is extremely convenient during a live performance setting, where you need to change between settings for different songs. It has been noted that this pedal provides good-quality digital EQ for guitar, however, one review states that the build quality is less than they expected, saying that it felt a little cheap and the rubber feet would regularly fall off (might be a case of gluing them on). However, we would argue that this is a die-cast Aluminium chassis, and therefore the unit is not going to fall apart! Other than this, owners have said that this pedal provides some good quality EQ, and is very convenient given how easy it is to switch between EQ settings. This particular pedal is ideal for the guitarist who firstly doesn’t mind using a digital EQ pedal (we imagine some are absolutely in love with analog, and that’s fine). 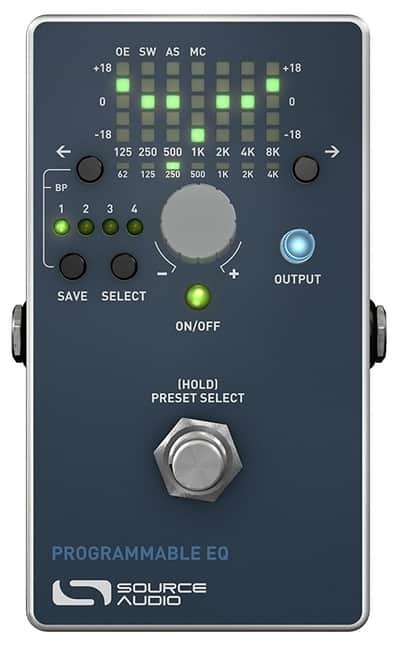 And secondly, for the guitarist who priorities convenience of use, especially when on-stage or in-studio, since this unit can easily switch between those 4 user programmable presets with the click of a button. Additionally, this features a Midi input, so that you can use it with all kinds of Midi devices, which will certainly be an attractive feature to some! The Align Equalizer Guitar Pedal has received an average rating of 4.7* out of 5 stars from 4 Amazon customer review – Read these reviews here. 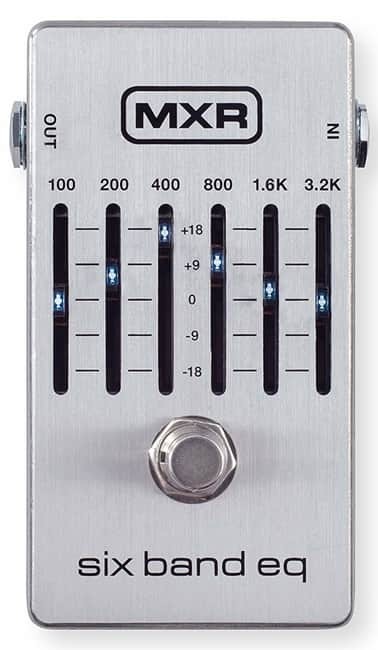 The L R Baggs Align Equalizer unit is an EQ processor made specifically for Acoustic Guitar. It has a wide range of unique features and aesthetics that make it a highly desirable EQ pedal for many guitarists. However, before we talk in depth about this pedals features, let’s first talk about the company LR Baggs, to get an understanding as to how this pedal came about being created. L.R. Baggs was founded by Lloyd Baggs, who started the company from his own workshop in San Francisco, after moving to Los Angeles, the brand really started taking off, after being noted to produce ultra-high-quality, great-sounding guitars. This was due to Lloyds dedication and persistence in innovating his products with a scientific approach to improving the design and electronics. This acumen, and company values that Lloyd founded his music equipment manufacturing business on are still incredibly visible within the company today, with the quality of its products being the major USP. 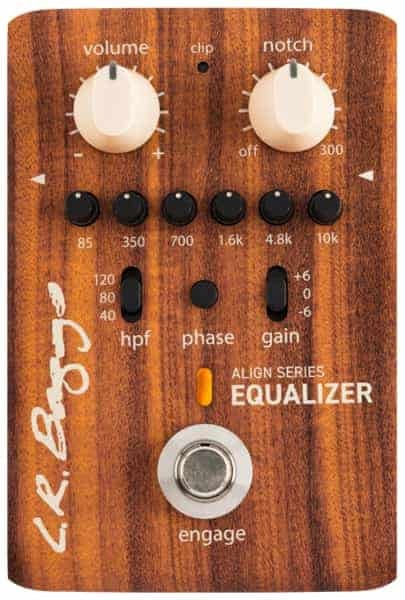 So, going back to the Align Series EQ pedal, it’s built with high-quality in mind. The unit features a 6-band EQ alongside an anti-feedback notch filter, a high pass filter, phase inversion controls, and a 3-position gain switch control… All of this constitutes to ensuring that your overall sound is flawless, and you’re not worrying about feedback or phasing issues. Ok, so that’s all fantastic, but how does this unit actually sound? Well, if you take a listen to the video demonstration below, you’ll notice that when engaged, the Align EQ unit really brightens up the mix, almost adding a smooth shimmer to the sound. Additionally, the unit’s 6-band EQ settings really do mean that you can isolate certain frequencies for boost/reduce control. Taking into account the high-quality sound, beautiful wooden aesthetic design and all of the parameter controls, we simply don’t have any suggestions on improvements that can be made regarding this pedal. We would class this unit as a boutique EQ pedal for acoustic guitar, and hence it’s ideal for the guitarist who is set on gaining a high-quality guitar EQ unit, regardless of the premium price tag. We would be inclined to say that this caliber of pedal attracts touring/recording artists, who want an incredibly good sounding EQ pedal. 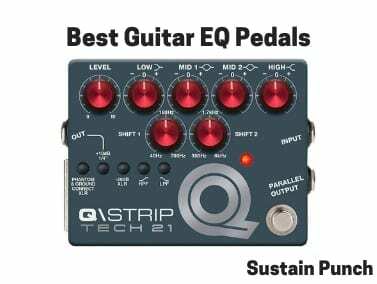 The Q\Strip EQ Processor by Tech 21 has received an average rating of 4.8* out of 5 stars from 6 Amazon customer review – Read these reviews here. The Q\Strip by Tech21 is guitar EQ and DI processing unit, marketed towards the premium-priced end of the market. The unit itself was inspired by the famed solid-state recording consoles that existed within the 1960’s/70’s, which were known to provide that warm, thick analog sound that we all know and love. 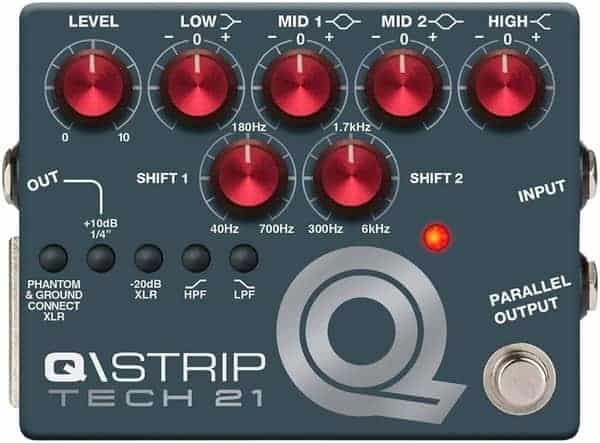 Tech 21 created the Q\Strip using all-analog MOSFET circuitry, alongside 4-bands of studio-grade EQ, inspired by the tone-shaping circuits of the classic console modules in the 60’s/70’s. Because of this, the Q\Strip provides that warm sounding analog tone, which is why its average Amazon rating is 4.8/5.0! It has a high pass filter and low pass filter, alongside providing a +10db boost on the 1/4inch output signal. As you can hear from the video demonstration, with the incredibly guitarist Pete Thorn playing, this processor certainly provides a refined, warm guitar tone! Now, we have to also admit that Pete is using some expensive gear, and so we cannot definitively say that all of this incredible tone is coming from the Q\Strip unit…. But it’s certainly contributing to the overall sound. However, Pete certainly knows how to do an EQ pedal demonstration, as he admits that he only uses the pedal’s EQ, with no post-recording EQ being added. Also, what’s apparent is how versatile the Q\Strip processor is since Pete uses it on Electric Guitar, Acoustic Guitar and Bass. Nothing! We really like how this pedal sounds, and the sheer amount of use that it can have for both recording and in a live performance… We understand that it’s a little more expensive than other units, but you’re paying for this incredible tone! This is an extremely premium-sounding, all-analog EQ unit, which is highly versatile! Therefore if you’re a guitarist who wants that analog sound, whilst the versatility to use it on multiple instruments in both a recording and live performance setting, this unit is for you! The Align Equalizer Guitar Pedal has received an average rating of 4.4* out of 5 stars from 36 Amazon customer review – Read these reviews here. 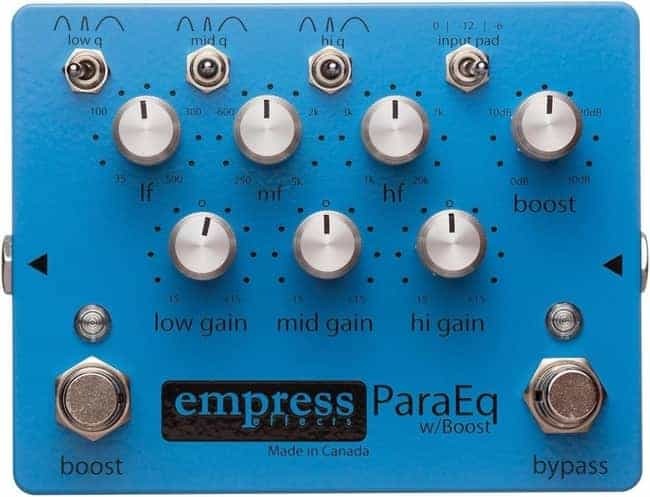 The ParaEQ is a parametric EQ pedal for Guitar, built by Empress Effects. For those who aren’t aware who Empress Effects are, they are a music equipment/guitar effects pedal manufacturer and have been around since late 2005. The team at Empress Effects really have a passion for producing premium-quality, premium-price guitar effects, and the ParaEQ is just one of the pedals in their product itinerary. The unit itself is the most expensive EQ and Boosting processors that we’ve featured on our list… And the main two reasons why we’ve featured it is because we like to accommodate for every budget, and also because this pedal has an incredible Amazon rating, scoring over 4.4/5.0 from over 36 reviews. The pedal has all-analog internal circuitry and is able to provide EQ & Signal boosting with less than 0.03% signal interference… Which is very low for any electronic device. So what is this unit capable of, well it’s great for general tone sweetening, with it enabling the user to add a boost to frequencies within the 3khz – 5khz range. Additionally, it can also provide some tonal correction, in case your instrument it sounding too much bass/treble… This way you can boost/reduce these frequencies by up to +-15bd. Simply put, this unit sounds incredible! It really does provide total tonal shaping that will help you sound great! If you’re at all familiar with the review recommendations that we like to make, then you’ll know that we do our very best to accommodate for each and every reader. Therefore, we’re going to make recommendations based on numerous factors and requirements that we think are important, so that you can be almost certain to find the best guitar equalizer pedal for you to purchase! So without further ado, here is a summary of the best eq pedals for guitar.